Republicans won the House in 2010 mid-term election, retaining the House in 2012 and claiming the Senate in the 2014 mid-terms. The Republicans continued their climb back to power in 2016 by retaining the House and Senate and adding the Presidency as Donald Trump won a resounding electoral college victory claiming 30 states. 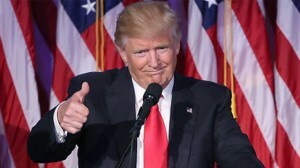 Though he lost the popular vote, President Trump moves into 2017 with a populist victory, a conservative agenda and control of the Congress to roll back President Obama's liberal policies.